In this issue of Now : When it comes to celebrities, Now magazine has the full who, what and wear on the stars you care about. Who they're dating and hating, what they're really feeling and all the details on what they're wearing. Every week we deliver breaking news and exclusive stories that will make you gasp. And, with new Now celebrity columnists and Dan Wootton's weekly showbiz interview we get readers even closer to the stars than ever before. You want glamour? It's in our DNA. Now is packed with fashion that won't just suit our readers' budgets but also their body type. Each week our style experts share their tips, secrets and give readers the self-confidence to make the hottest celeb trends work for them. 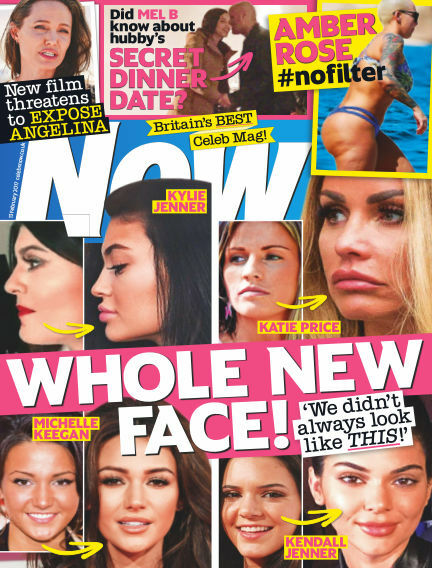 With over 1.2 million unique users and 9.8 million page impressions every month www.nowmagazine.co.uk is the UK's third biggest women's lifestyle site (Hitwise 2012). The site is home to all the latest celebrity and style news, galleries, videos and blogs add to the user experience, with unique insight and behind-the-scenes coverage making it a key touch point for the Now brand. Now is instantly accessible through its fully mobile-optimised website and up-to-the minute mobile app - available on all mobile platforms. It is also the first UK celebrity and style news brand available on the new Google Currents App platform. The magazine itself supports this mobile presence with a consistent use of QR codes throughout, providing readers and users with huge added value and a complete multi-media experience. Now's thriving and engaged social media networks, which have grown by over 400% in the last 12 months, provide a constant point of direct two-way communication for the brand. In total there are over 4.7m interactions with Now every month via its growing number of touch points, which proves that Now is THE destination for the latest breaking celebrity news, gossip and fashion. With Readly you can read Now (issue 13th February 2017) and thousands of other magazines on your tablet and smartphone. Get access to all with just one subscription. New releases and back issues – all included.